Archive — What's the Difference? What's the Difference Between a Church, Chapel, Cathedral, and Basilica? While our news feeds and social feeds were filled with updates on the horrible Notre Dame fire last week, few stories answered what I, without a newsletter to motivate me, would have maybe been too embarrassed to ask: What type of building is Notre Dame, exactly? And what, besides its rich history and architectural splendor, makes it different from the places that regular churchgoers visit, say, on Easter Sunday? The answer lies within the differences between a church, chapel, cathedral, and basilica. A church is any place of worship that has a permanent congregation and is run by a pastor or priest. The term can refer to both the actual space as well as the congregation; you might go to church on Sundays and also really love hosting your church’s book club. You’ll find churches across all denominations of Christianity, and it can mean anything from the grandest architectural wonder to a group of congregants gathering regularly to worship without a permanent physical space. A cathedral is a church that’s run by a bishop; it’s the principal church within a diocese, the area of land over which a bishop has jurisdiction. It’s named for the cathedra, the special chair in which a bishops sits. And contrary to what might seem like the obvious differentiator, the buildings themselves have no physical requirements; all the fancy stained glass and flying buttresses might be along for a ride, but it’s all about the bishop. As long as it’s where the bishop sits, it’s a cathedral. As for basilicas, there are two types: basilicas major and basilicas minor. The basilicas major are the four personal churches of the pope and are in and around Rome: the Archbasilica of St. John Lateran, St. Peter's Basilica, the Basilica of St. Paul Outside the Walls, and the Basilica di Santa Maria Maggiore. Basilicas minor can be found around the world and are rewarded that status by the pope, usually because of some sort of historical, spiritual, or architectural significance. The term “basilica” is an additional label to whatever the structure already is; any cathedral or church can also be a basilica. What's the Difference Between a Couch and a Sofa? After a long day, there are few things more satisfying than kicking off your shoes and swan-diving into a piece of upholstered furniture. But is that piece of upholstered furniture a sofa or a couch? Let’s find out. The term “couch” comes from the French word “coucher,” which means “to lie down.” The word “sofa,” on the other hand, comes from the Arabic word “suffah,” which refers to a wooden bench covered in blankets. The origins of the words point to the major differentiator between the two pieces of furniture: couches are comfort-forward, and sofas are design-forward. So are you lying down on it? Call it a couch. Are you only allowed to sit on it on special occasions? Sofa. Shoving Doritos in your mouth while watching college basketball on it? Couch. Laundering your clothes before you step within three feet of it? Sofa. What's the Difference Between Soy Sauce, Shoyu, and Tamari? One of the goals of What’s the Difference—besides pure delight, and being correct—is to make everyone’s worldviews a little bit bigger. So whether you’re the type of person whose pantry looks like a seventeenth-century apothecary or someone for whom the word “soy sauce” is the only part of this title you recognize, you are all welcome, seen, and celebrated. We’re all here to bathe in the JOY of KNOWLEDGE—so let’s take a dip, shall we? Soy sauce was first invented approximately 2,000 years ago, using a process that is quite similar to the one we use today. To make it, soybeans and roasted wheat are mixed together and inoculated with Aspergillus mold, or koji. (Koji is also the mold used to make miso paste and sake.) After three to four days, the soybean-wheat-koji mixture is combined with water and salt to form a thick mash. The mash is then put into large vats and fermented, traditionally for eighteen months or longer, and then strained and bottled. Soy sauces can be Chinese-style or Japanese-style. Chinese-style soy sauces traditionally are made with 100% soy, while Japanese-style soy sauces are made with a mix of soy and wheat (usually 50/50). This gives the Japanese sauces a sweeter, more nuanced flavor than their Chinese counterparts, which are usually saltier and more aggressive. Shoyuis simply the name for the Japanese-style soy sauce, which can be light (usukuchi) or dark (koikuchi). Other soy sauce variants include Chinese light soy sauce, or “fresh” or “thin” soy sauce, which is the most common soy sauce in Chinese cuisine; Chinese dark soy sauce, which is thicker and darker in color but less salty than the light sauces and sometimes contains sugar or molasses; and sweet soy sauce, or kecap manis, an Indonesian style of soy sauce that’s popular across Southeast Asia. Sweet soy sauce is flavored with palm sugar, star anise, galangal, and other aromatics, giving it what Max Falkowitz at Snuk Foods calls a “barbecue-sauce consistency.” It’s popular in stir-fries and rice and noodle dishes, and it’s also great used in a marinade. One more thing: before you buy any soy sauce or soy-sauce-like product, make sure to check the ingredients first. These days, there are bottles of stuff that are sold as soy sauce but contain tons of gross chemicals, aimed at replicating the soy sauce taste while bypassing the traditional fermentation process. According to Max, “If you see anything besides soy beans, wheat, salt, and mold cultures on the label, such as caramel coloring and ‘natural flavors,’ steer clear.” With so many options of what you can buy, it should be easy to do so. What's the Difference Between a Cop, Sheriff, and State Trooper? No matter how you feel about law enforcement these days, let’s face it: most of the time, we try to follow the law, and we expect the people in our lives to follow the law, too. The presence and importance of the law is why we need people in our society who make sure that it’s upheld—and in America, this makes for a system that’s notoriously difficult to navigate. Exhibit A: What’s the actual difference between a cop, sheriff, and state trooper? Let’s get into it. The term “cop”—or police officer—can refer to a patrol officer, a correctional officer, or a sheriff’s deputy. Patrol officers are the men and women in the classic blue uniforms, whose jobs include the pursuit and arrest of criminals, response to emergency and non-emergency calls, and enforcement of motor vehicle and criminal laws. Patrol officers can also be appointed to a special unit, such as motorcycle, canine corps, or SWAT teams. The major difference between a patrol officer and a sheriff’s deputy is their area of jurisdiction. Sheriff’s deputiesspecifically operate within a county, and their responsibilities are quite similar to those of patrol officers. Patrol officers usually work within the jurisdiction of a city or town, though they can also work for a state, county, hospital, college, transit district, or any other governmental organization that has the ability to create its own law-enforcement branch. Correctional officers have a much different set of responsibilities than their other cop counterparts. They’re specifically in charge of enforcing the rules inside a state prison or jail: overseeing the inmates as they go about their daily routines, resolving conflicts, and inspecting the facilities to prevent escape. Now, let’s move onto the role of the sheriff. A sheriff is an elected official and is essentially the CEO of the sheriff’s department. Most sheriffs operate under the county government—in fact, the only state without sheriffs is Alaska, which has no counties. The word “sheriff” is actually a portmanteau of “shire reeve,” which was the tax collector in medieval England. These days, some sheriffs are still the tax collectors for their counties. But sheriff responsibilities can vary greatly from state to state: In some states, the position is largely ceremonial, and essentially just includes serving papers and providing security for the courts. In other states, the sheriff is also in charge of the county jail. And most states look to the sheriff’s office to provide general law-enforcement services (so, police officer–type services) to cities that don’t have their own police forces or to unincorporated parts of the county. Unlike cops, who usually work for the city, or sheriffs, who work for the county, state troopers work for the state. They serve as highway patrol or as part of state-wide police agencies. You can tell who they are by their brown uniforms, which have star-shaped badges and patches to indicate their rank, and their large, wide-brimmed hats. And for a BONUS ROUND: What about marshals and rangers? A marshal is an enforcement officer of the court and provides security for the court and court staff. Marshals can also be in charge of serving subpoenas and arrest warrants. Rangers, at least in the state-level-officer sense, are limited to Texas, where they’re the top of the state police force. Many states also have park or forest rangers that either act as the police force for their governmental subdivisions or as naturalist or conservation officers. What's the Difference Between a Hero, Sub, Grinder, and Hoagie? Some things in life are simple: we know that two pieces of bread with stuff between them, for example, is a sandwich. Swap in a long roll, however, and things get a lot more complicated. Looking at the regional breakdown, "sub" is also clearly the winner—except for one, lonesome state. 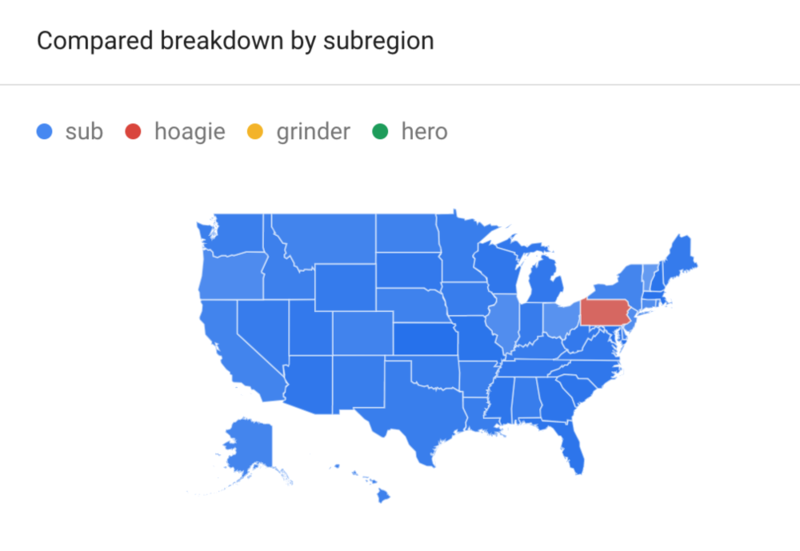 Pennsylvanians—Philadelphians, in particular—have their "hoagies." A hoagie is just a sub—the Oxford English Dictionary literally defines it as a "submarine sandwich"—but the Pennsylvania folk have insisted on making it their own. According to Bon Appétit, the term likely comes from Depression-era jazz musician and sandwich-shop owner Al De Palma, who started calling his submarines "hoggies" because you "had to be a hog" to eat a sandwich that big. (So judgy!) "Hoggies" somehow morphed into "hoagies," and you got yourself a regional sandwich term. Head over to New York City, and you’ll see a similar sandwich referred to as a "hero." The term likely comes from New York Herald Tribune columnist Clementine Paddleworth (yes, that was her name), who in 1936 described a sandwich so large "you had to be a hero to eat it." More so than a sub, a hero can refer to both hot and cold sandwiches, which is why you’ll see things like meatball heroes and chicken-parm heroes on menus around the area. Lastly, we have grinders, which is the New England–based term for a hero. According to Bon Appétit, "some claim that it was named for 'grinders,' Italian-American slang for dockworkers (who were often sanding and grinding rusty hulls to repaint them)," but the term most likely comes from the fact that they were harder to chew than normal sandwiches: "that toothsomeness got translated into 'grinder,' since that's what your teeth had to do to get through a bite." What's the Difference Between Sunscreen and Sunblock? As a former food writer, I have a complicated relationship with seasonality. When you’re banned from writing about tomatoes and eggplant and corn outside the hours of late July to early September, you know what you want to do? You wanna write about tomatoes in December. So with What’s the Difference, we’re deciding that seasonality is a construct. (Unless it serves the purpose of a cute newsletter introduction—in that case, we love the seasons.) And unlike tomatoes in December, which are objectively gross, sunscreen and sunblock should be worn year-round! But before we get to skincare tips, let’s dig into the difference. Sunscreen is a lotion that absorbs the sun’s ultraviolet (UV) rays; it contains chemicals that soak them up before they reach the skin. It’s therefore referred to as a chemical sunscreen. Sunscreens can have a wide range of active ingredients, but the good ones contain benzophenones, which protect against UVA rays (the ones that cause premature aging and wrinkling), and cinnamates and/or salicylates, which protect against UVB rays (the ones that cause sunburns). Sunblock, on the other hand, reflects the sun’s rays from the skin instead of absorbing them. It’s therefore thought of as a physical sunscreen. Sunblock is usually thicker and more opaque than sunscreen, and it can sometimes leave behind white residue. And although it’s heavier, sunblock’s active ingredients—titanium dioxide or zinc oxide—are gentler, making it a safer choice for people who have sensitive skin. Dermatologists say that unless you have a personal preference, both sunscreen and sunblock are fine to use—one’s not better than the other. However, whatever you choose should have an SPF of at least 30 and protect against both UVA and UVB rays; if you see the term “broad spectrum” on the label, you’re good to go. And make sure to avoid suntan lotion, which is a different product altogether; it usually has an SPF of 15 or lower, and is made with oils that don’t protect your skin at all. You might want that sun-kissed look, but safety comes first—no matter what season it is. What's the Difference Between Courage and Bravery? When we’re young, there are a group of virtues that pepper the lessons that we learn, the books that we read, the movies that we watch, the games that we play: Kindness. Compassion. Bravery. Courage. We’re taught to emulate these traits in our day-to-day lives: to do unto others, to always tell the truth, to stand up for what’s good and right. But the bigness of these qualities can overshadow any nuance, especially when there are mysteries to solve or villains to trick or princesses to save. So the small, but worthy distinctions between them—especially something as delicate as the difference between courage and bravery—are often left unsaid, until decades later when a newsletter pops into your inbox and sets the record straight. Bravery is the ability to confront something painful or difficult or dangerous without any fear. It’s a quality, not a state of mind; it doesn’t need a cause to awaken it. Someone is brave—full stop. To the person who has it, it’s effortless; it’s eating a caterpillar on the playground because a friend dares you to, without a second thought. It’s jumping from the highest diving board without any hesitation. Courage, on the other hand, is the ability to confront something painful or difficult or dangerous despite any fear. It’s not a quality, but a choice; a person feels the fear or pain or danger, but chooses to persevere anyway. Unlike bravery, courage is driven by a cause; the courageous person believes that cause is worth standing up and fighting for, despite all the clear reasons not to. It takes a great effort, because what’s on the other end merits it. So if you don’t consider yourself brave, don’t despair. When a cause is worthy enough—when you have something worth fighting for—that’s where courage steps in. Courage isn’t something you need to already have; it’s something you can find. What's the Difference Between Corned Beef and Pastrami? Here at What’s the Difference HQ, we’ve already covered the distinction between deli and appetizing and the intricacies of the appetizing case. But the deli counter has its own pressing questions—because while you may have some vague understanding that pastrami and corned beef are two different things, and that one might be better than the other, you may be stuck on the how or why. Here are the major points of differentiation between the two, because no meat should ever be a mystery. COUNTRY OF ORIGIN: Pastrami has two possible ancestries: it’s either Romanian (where its predecessor, pastrama, was made with pork or mutton) or Turkish (where it’d be a descendent of pastirma, made with beef). Corned beef hails from Ireland, which is why it's eaten on St. Patrick’s Day. CUT OF MEAT: Today’s corned beef and pastrami are both made from beef, albeit different parts of the animal. Corned beef is made from brisket, which comes from the lower chest of the cow; pastrami is either made from a cut called the deckle, a lean, wide, firm shoulder cut, or the navel, a smaller and juicier section right below the ribs. These days, you may also see pastrami made from brisket. BRINE: Pastrami and corned beef are brined before they’re cooked; they’re either rubbed with or submerged in a solution of salt and spices to infuse the meat with more moisture and flavor. Both are brined in a mixture of salt, sugar, black pepper, cloves, coriander, bay leaves, juniper berries, and dill, as well as the preservatives sodium nitrate or sodium nitrite. SPICE MIX: Here’s when things really start to differ. After brining, pastrami gets coated in a mixture of black pepper, coriander, mustard seeds, fennel seeds, and sometimes fresh garlic; that spice coating is what gives it its blackened appearance. Corned beef is… naked. No spice mix to speak of. COOKING METHOD: Pastrami is smoked over hardwood, oftentimes with a pan of water nearby, which helps create steam and keep the meat moist. It’s then cooled and then steamed before serving. Corned beef is… boiled. Sometimes with cabbage and other accoutrements in the mix, too. BONUS ROUND: If you’ve ever been to Montreal, you may be wondering: What does “smoked meat” have to do with all this? Smoked meat is a Canadian specialty that pulls from the same themes as corned beef and pastrami, but has a story arc of its own. It’s made with brisket and is brined in a mixture of black pepper, coriander, garlic, and mustard seeds—but with much less sugar than its pastrami and corned-beef cousins. It’s then smoked, like pastrami, and is best layered onto rye bread with mustard for serving—just like the rest of family. As a girl, I was never into princesses; I was more of the type to watch monster-truck videos with my brother and read almanacs for fun. However, as an adult, I find there’s something rather aspirational about the royal lifestyle, or at least the royal lifestyle of years’ past; who wouldn’t want to sit around eating teacakes and playing whist all day? I hereby present to you the differences between a castle and a palace—because if we can’t live like royals ourselves, we may as well know the terminology. A castle is a large, fortified residence or group of buildings with strong walls to defend against attacks. In their heyday, they were inhabited by a royal or noble and used as a seat from which to control the surrounding area. Castles oftentimes have moats, peep-holes in the walls from which to shoot arrows, and other defense-centric architectural touches. They were first built by royalty during the Middle Ages throughout Europe and the Middle East, and served as fortresses to guard whoever was doing the ruling. A palace, on the other hand, is designed simply for elegance, lavishness, and luxury. No fortified walls, no moats, no cannons—they’ve more of the gilded-chic vibe. Palaces were/are lived in by royalty, heads of state, or heads of a church, and are usually surrounded by lush, landscaped gardens. The first palaces were built on Palatine Hill in Rome, which is actually where the name “palace” comes from. What's the Difference Between Sleet, Hail, Graupel, and Wintry Mix? No matter what background or tradition or religion or belief system you identify with, I think we can all agree: when crazy stuff starts falling from the sky, things get weird. Turns out there are so many crazy things falling from the sky these days that we now must expand our vocabulary. My friends, it’s time to get cozy with hail, sleet, graupel (yes—this is a real thing), and wintry mix. But first: some background. Hail, sleet, graupel, and wintry mix are all forms of precipitation that start off as snow. Snow stays snow when the temperature between the clouds and the ground stays at around 32°F the entire way down; it’s when the temperature gets warmer somewhere en route that interesting stuff starts to happen. Sleet is what forms when there are warmer temperatures in the air and near- or below-freezing temperatures on the ground, or when cold air “sandwiches” a pocket of warmer air. This combination causes snowflakes to melt on their way down and then re-freeze as they get closer to the ground, turning into translucent little pellets of ice. Graupel, on the other hand, happens when there are freezing temperatures in the air and above-freezing temperatures closer to the ground. Snowflakes get caked in near-frozen drops of rain, forming soft, opaque white balls akin to what the National Weather Service so aptly describes as “Dippin’ Dots.” For such an ugly name, I personally think graupel sounds quite lovely; it’s like snow on steroids, or like the pearl-sugar topping on a brioche, but soft. Wintry mix, as one might guess, is a gross mix of snow, graupel, sleet, and freezing rain, because turns out multiple things can fall out of the sky at the same time! However, instead of the clouds spewing out a trail mix–like mixture, which would actually be kind of cool, we get any of those forms of precipitation falling in areas very close to each other, or switching off as the day progresses. (Meteorologists use the term “wintry mix” to essentially avoid getting too specific.) According to this story in the New Yorker, wintry mix most often happens in the central or eastern United States, thanks to a lovely concoction of cold air from Canada, warm air from the Gulf of Mexico, stormy air from the Rocky Mountains, and western air coming in on a jet stream. These all create a setting perfect for crazy frozen things to form and fall to Earth. Lastly, we have hail, which only falls during thunderstorms and is actually most common in warmer conditions during the spring, summer, and fall. Hail starts as soft, snow-like particles that form in the below-freezing air at the top of thunderstorms (because it’s still cold up there, even in the summertime). As these particles fall into the storm, ice crystals and cloud droplets freeze onto them, and they stay suspended in the clouds for a while, gathering up more frozen stuff. When the pellets get too heavy, or when the winds that push them up into the clouds get too weak to keep them afloat, they start falling to the ground. Hail is usually only the size of a penny, but the largest recorded hailstone fell in 1986 over the Gopalganj district of Pakistan and was… 2.25 pounds. Imagine the terror when that fell out of the sky. Stay safe out there! What's the Difference Between an Orchestra, Symphony, and Philharmonic? If you’re like me, feeling cultured feels good. There are few sensations as pleasant as learning something new, or exploring a different place, or doing something that expands your world even a miniscule amount. Also: being able to talk about feeling cultured feels good. Part of the fun of doing culture-y stuff is telling people about it, whether it’s excitedly or earnestly or just to show people how very cultured you are. You know what doesn’t feel good? Trying show people that you’re cultured, and being WRONG. Nope, I think that’s a feeling we’d all like to avoid. And with that, let’s learn the real difference between an orchestra, symphony, and philharmonic. An orchestra is a large group of musicians that usually includes the four major sections of Western instruments: strings, brass, winds, and percussion. A symphony is a large-scale piece of music that typically contains three to four movements. And with that, may I suggest Dvorak’s Symphony No. 9 and Beethoven’s Symphony No. 7 (particularly the second movement)? Because we can now resume talking about how cultured we are. What's the Difference Between Four-Wheel Drive and All-Wheel Drive? It’s winter, people, which means fuzzy socks and hot chocolate and snuggling on your couch to watch not one, but TWO documentaries about the Fyre Festival. It also means single degrees and snowstorms and slippery roads—and, for those of us who drive on a regular basis, it’s a time to be extra-careful. It behooves us, then, to learn the difference between four-wheel and all-wheel drive—because despite the fact that the four wheels might be all the wheels, they are not the same thing. Let’s ease into it. In two-wheel drive, or 2WD, torque is applied to either the front or rear wheels, depending on the type of vehicle. This is more suitable for driving in mild climates, where a car doesn’t have much need for real traction. But both four-wheel drive (4WD) and all-wheel drive (AWD), as their names suggest, power all four of the vehicle’s wheels. So how do they differ? In all-wheel drive, the car sends a variable amount of torque to each wheel, depending on which wheels need it the most in any given moment. Four-wheel drive sends a fixed amount of torque to each wheel, which makes it much better for off-roading—but not as great for regular driving. That’s why most four-wheel drive vehicles have a two-wheel drive mode, and the driver can switch back and forth depending on the conditions. It makes sense, then, that four-wheel drive is only found in SUVs and trucks that have higher ground clearance; these are the sorts of vehicles that you see fearlessly lumbering through the mud in football-game commercials. All-wheel drive, on the other hand, can be found in all types of cars and trucks, not just the off-roaders. No matter what-wheel drive you have, stay safe out there! What's the Difference Between Russian and Thousand Island Dressing? If you’ve frequented a salad bar recently—or returned from a quick jaunt from, say, the 1950s—you may recall a bowl or two of pink, florescent dressing with some chopped-up stuff in it. Maybe you dolloped some of it onto your plate of greens, or had a white-tocqued chef at the meat-carving station slather it on a sandwich for you. In any case: Was it Russian dressing or Thousand Island? If it wasn’t slapped in a bottle with a label, would you be able to tell the difference? Let’s find out. Russian dressing is made with a mayonnaise-ketchup base, often livened up with pickle relish, Worcestershire sauce, prepared horseradish, and lemon juice and seasoned with paprika, onion powder, and/or mustard powder. It’s spicier and less sweet than Thousand Island, with a more complex, nuanced je ne sais quoi. Some say it got the “Russian” in its name because it once contained caviar: according to a 1957 New York Times article, an early version of the dressing in Larousse Gastronomique called for mayonnaise, tinted pink with the poached coral and pulverized shell of a lobster, seasoned with black caviar and salt. In any case, the creator of the dressing, a man named James E. Colburn of Nashua, New Hampshire (not Russia), sold so much of it that he acquired “a wealth on which he was able to retire.” Jealous. Thousand Island dressing also has a mayonnaise-ketchup (or chili sauce) base; includes pickle relish and/or other chopped vegetables, such as pimientos, olives, and onions; and has some more rogue, recipe-dependent ingredients thrown into the mix, like parsley, chives, or hot sauce. The big differentiator, however, is the addition of a chopped up hard-boiled egg, which acts as a thickener and binds the ingredients together. The name comes from the region between northern New York state and southern Ontario, which is where it was invented in around 1900—most likely at one of the resorts up there that city folk frequented in the summer. These days, you’re more likely to find the two dressings on sandwiches rather than salads—with Russian typically on a Reuben, and a Thousand Island–type spread used as the “secret sauce” on a Big Mac. But sadly, according to the Washington Post, “an examination of menus around the country shows that Russian dressing has all but disappeared from America’s national consciousness.” What’s more—and we just love this sort of thing at What’s the Difference HQ—what is actually Russian dressing might now be labeled as Thousand Island. “Sometimes it’s easier to just make things quickly understandable for the customer, to avoid wasting time explaining things,” Nick Zukin, co-author of The Artisan Jewish Deli at Home, told the Post. “Even if you made what was essentially a Russian dressing, you might call it Thousand Island just to avoid headaches." What's the Difference Between Lotion and Moisturizer? It’s the new year, people, which means it’s time for green tea and grain bowls and Meditation and Self Care. It’s time to treat ourselves to feeling good; it’s time to mask our faces with indigenous soils and lather up our bodies like we’re in some sort of commercial and luxuriate in the warmth of our collective internal glow. But before we spend our first week’s paycheck on the season’s buzziest new product, or raid the drugstore aisle for another promised cure-all, we should probably know—what exactly are we rubbing all over ourselves, anyways? It’s time to learn the difference between lotion and moisturizer. First, let’s talk about moisture. It’s easy to think of moisture as water; when something is moist, it’s kind of wet, right? But when it comes to skin, water is a horrible moisturizer; it evaporates too quickly to soak in. Lotion has a higher water content than moisturizer, and therefore does its work on top of the skin to cause some sort of effect, like preventing sunburn. Lotions certainly can carry vitamins and minerals, but ones that have a topical use; they’re doing something on the surface on the skin, rather than penetrating it. Moisturizer, on the other hand, is a cream that’s designed to bring moisture or vitamins or minerals into the skin, not just on top of it. This means that many moisturizers have sealing agents, like mineral oils or petroleum jelly, to help lock in that moisture. Moisturizers are therefore thicker than lotions, and are more effective for treating dry skin—especially in the winter. Another thing about water? The more water that a product has, the more likely it is to attract bacteria—which is where preservatives and fragrances come in. Because lotions are more water-based than moisturizers, they’re more likely to have extra added ingredients, and therefore are more prone to irritate your skin. So when you’re shopping, be aware—those cucumber/coconut/cantaloupe scents might seem great, but they have a purpose other than making you smell like a spa. Emotions are complicated. And if you, like me, would rather spend your time baking a deranged amount of granola or meticulously color-coding your closet instead of actually facing them, I feel you. But part of being an adult is trying to make sense of the things we feel in a given day—and it helps when you can actually define them. So let’s start with the difference with jealousy and envy, shall we? To put it bluntly, we feel envy when we want something that someone else has that we don’t. As in: I’m envious of her flowing mane of hair, or her new high-powered job, or her angelic ability to play the trombone. On the other hand, we feel jealous when something we possess is being threatened by another person—or, in other words, when we worry that someone will take away something that we already have. You may feel jealous, for example, when your girlfriend is dancing with another guy; the emotion is a direct result of something you have (a relationship) being threatened by someone else. In short: envy is a reaction to lacking something, while jealousy is a reaction to the threat of losing something. Although the two emotions are actually quite different, it’s easy to get them confused. First off, many people use them interchangeably; you may hear something like, “I’m jealous of his rock-hard abs,” when the correct term would actually be “envious.” Many times, however, jealousy and envy travel together; you may feel jealous when another guy is chatting up your girlfriend, and you may also be envious of some qualities that he has that you don’t. But chances are, statistically, that guy doesn’t subscribe to What’s the Difference. So at least you have that going for you!